Bergamo probably isn't on your list of "can't miss" Italian travel destinations. I mean, the country is an embarrassment of riches in that regard. Tourists come in hordes for the natural, cultural, culinary and historic offerings of Rome, Venice, Florence, Verona, Milan, Pompeii, Rimini and Pisa just to name a few. When we were looking for a way to bridge our journey from Prague to Venice, a direct flight into Bergamo came onto our radar. Located just outside of Milan, it may have been easy to swing over to the fasionista capital for a couple of days, but upon further research we realized that Bergamo offered a treasure of sights within its own city limits. The first thing you need to know about Bergamo is that it is infact a tale of two cities. "Citta Alta" the medieval old town, and "Citta Basso" the larger, modern lower town. 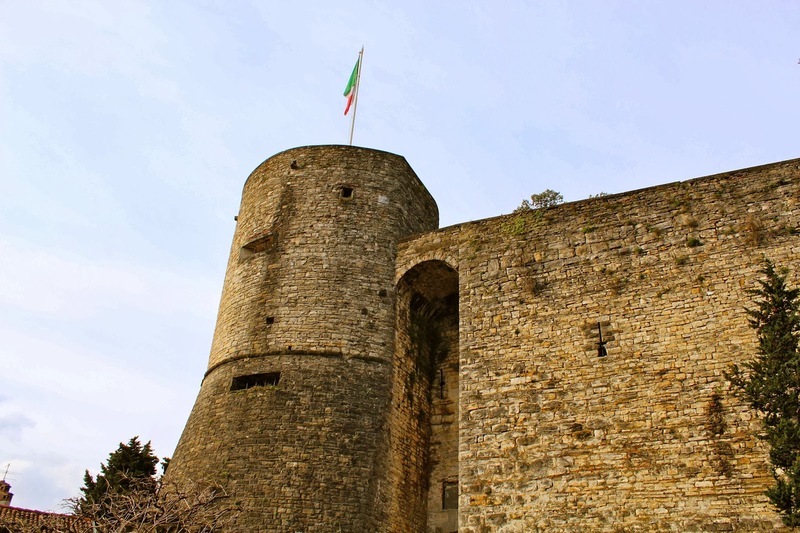 From a traveller's perspective, everything you want to get out of Bergamo is in Citta Alta. Perched atop a hill, the old town offers views of both the main part of the city to the south, as well as the towering distant Alps to the north. Our hotel, Agnello D'Oro was a perfect location for exploration through the cobbled, winding streets. Citta Alta is small, but what it lacks in size it makes up for in medieval charm. First stop was the Piazza Vecchia (old square) with it's towering clock tower, picturesque fountain and historic church. The square is typical of those in many small Italian towns, featuring a cafe, bar and gelateria. We were disappointed that most of the shops closed up before 8pm, as my other experiences with small town piazzas were that they were much more vibrant after dark. We chalked this up to the time of year. Next stop along the old cobbled streets was to the funicular station. The city offers two funicular (cable car) routes. One that connects Citta Alta with Citta Basso below, and the other which heads even further up the hill from Citta Alta to a small residential area. Unless your looking for a larger selection of restaurants or some shopping, I wouldn't recommend heading down to the main part of town, however a quick jaunt up the north-bound funicular will provide some excellent views. A final worthy stop is the 13th century fortress. We had a totally private walk around the fortress grounds and took in the spectacular views and history, totally free from the tourist crowds that surrounded the rest of our European sight seeing on the trip. If you are up in Citta Alta for only one meal, I highly recommend Da Franco for fantastic pizza. Keep in mind that most of the town, safe from a few restaurants, close up shop between 7pm & 8pm.